The first time we tasted Beef Corned Silverside, it was at a friend's house and to be honest, we did not like it (not that we were going to say it there! but our friends also did mention they might have gotten the recipe wrong too). And that's because it was too salty. 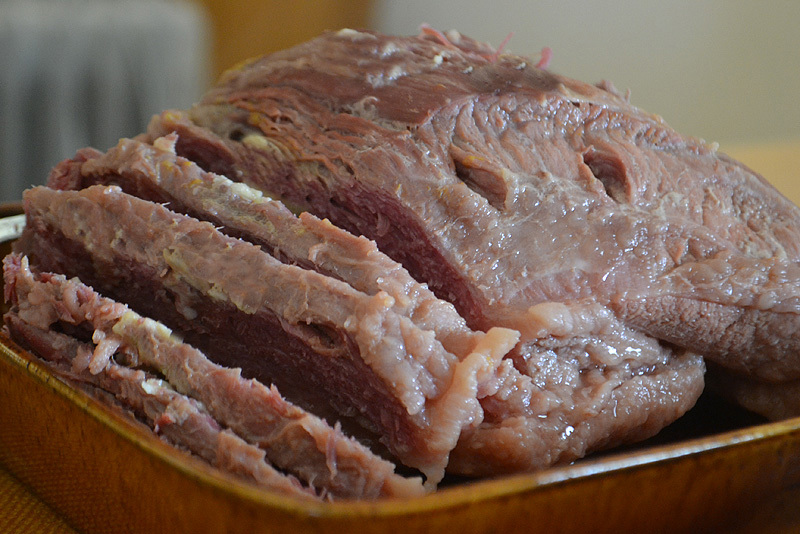 Beef Corned Silverside is naturally salty off the shelf so we assumed there's a trick to cooking it. We did not attempt to buy and cook this meat since then because we also did not know how - until we saw this recipe at Countdown. A kilo of this meat is too big for one sitting for us, so I had some of these for lunch the following day. I must say it tasted better than when it was served the day it was cooked. I guess it's because the flavours have had more time to combine overnight. It has the texture and distinctive taste (although not as strong) of canned corned beef, with a note of garlic and orange flavours as most noticeable. But more importantly, the strong salty taste has been toned down considerably! Rinse the meat, and remove any visible fat. Push the cloves into the meat. We had to make some incisions in order to do this (not sure how we were going to accomplish this otherwise). Place the meat in a heavy-bottomed pot, ensuring the pot can accommodate the meat and the liquid that will submerge this. 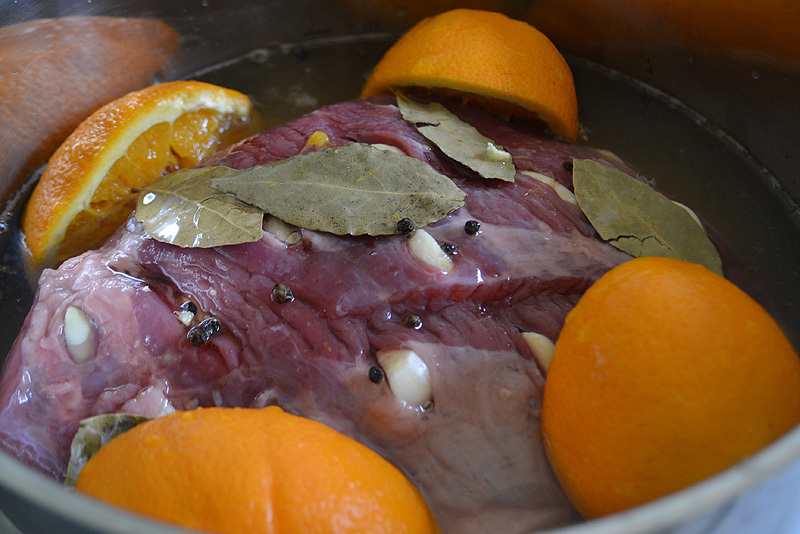 Add the bay leaves, peppercorns, and golden syrup. Cut the oranges, squeeze the juice into the meat, and leave the orange halves in the pot. Fill the pot with water, ensuring the meat is covered. Cover the pot and cook under medium heat for 1-1/2 to 2 hours. 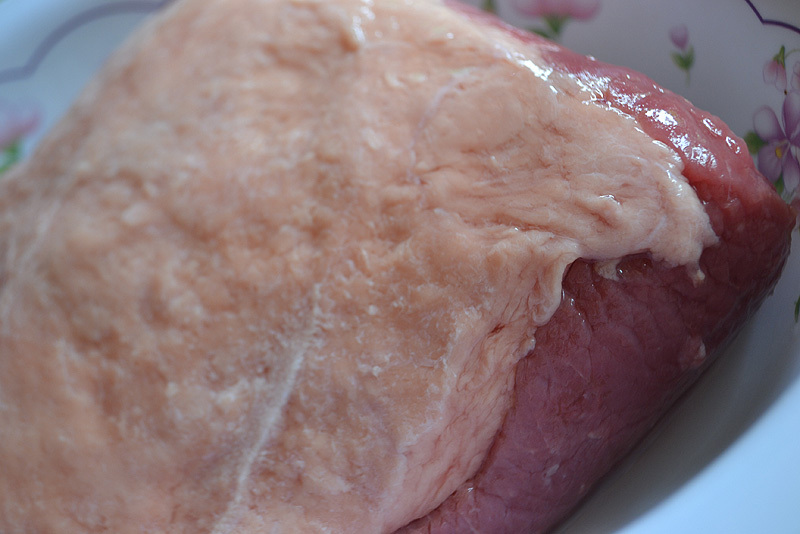 Once cooked, remove meat from the pot, cover, and set aside for 12-15 minutes. 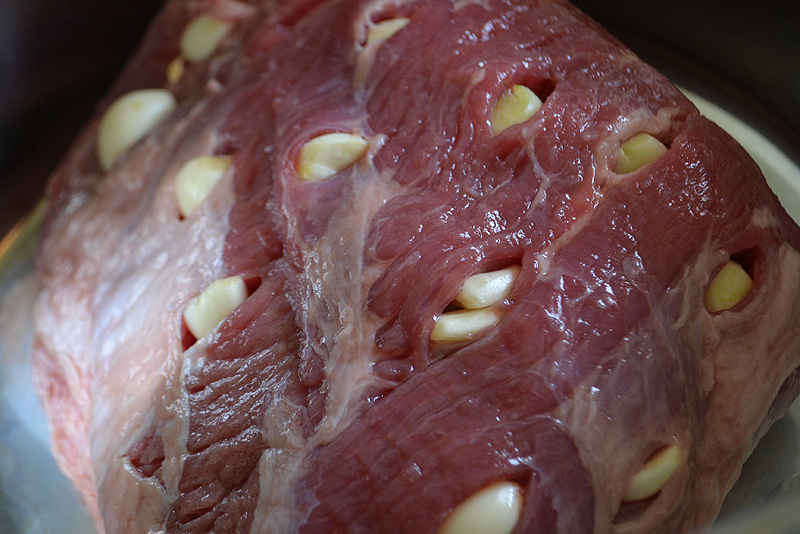 Remove cloves from the meat and slice across the grain to serve with mustard sauce.